CHICAGO, IL-The Screen Works' POP-screen Digital Signage has found a new home at Chicago's Shedd Aquarium. Prominently displayed within the Waters of the World exhibit, the POP-screens welcome guests as they enter each of four galleries, including Rivers, Islands and Lakes, Local Waters, and Oceans within the exhibit. Each POP-screen display features information specific to the topic in the gallery. The Screen Works' POP-screen digital signage displays are positioned throughout Shedd Aquarium's Waters of the World exhibit. The POP-screens provide a way to highlight the exhibits as a must-see attraction for visitors. In a year that marks the museum's 75th anniversary, the Shedd chose to integrate the POP-screen product because the discreet design and superior image uphold the aquarium's standards and reputation for combining its classical setting with state-of-the-art technology. "We are excited to have The Screen Works gallery screens in our Waters of the World exhibit at Shedd Aquarium. The screens have enhanced the Shedd's exhibit galleries, providing high quality backdrops for visual imagery that is a feast for the eyes and inspiration for the soul," said Dana Thorpe, director of exhibit design at Shedd Aquarium.While the Shedd committee planned for displaying information in the exhibits, they wanted the display to integrate with the museum architecture but still have the ability to deliver dynamic graphics and video in a technologically sophisticated way. "We began our discussions with the Shedd at InfoComm's 2005 digital signage exhibit in Vegas," explained David Hull, national sales manager for The Screen Works. "John Siska, the audio visual coordinator from the Shedd, visited our booth and we discussed their display requirements and the benefits of POP-screens. To authenticate the product benefits, we demonstrated the screens in the actual museum environment. Our POP-screen demonstration allowed the Shedd to make direct comparisons with similar products and to clearly see that images displayed were viewable from a broad range of angles-that was a major factor in choosing the POP-screen product." 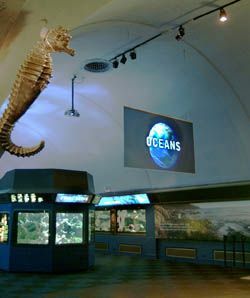 Today, as a direct result of the real world demonstration, four 52-inch by 92-inch high-contrast HDTV-formatted POP-screens are suspended prominently at the Shedd. The exhibits were unveiled when the Shedd Aquarium hosted an exhibition of the American Zoo and Aquarium Association. Made from 3/8-inch thick cast acrylic, POP-screens are available in front and rear projection and in sizes from 50 inches to 95 inches diagonal. "That makes for a particularly effective marketing tool," explained Hull. "POP-screens require minimal display area while being tremendously effective at attracting attention, delivering information, and displaying dynamic imagery.